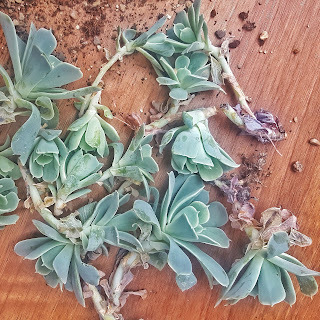 Like most things succulents need a little bit of maintenance to keep looking their best. 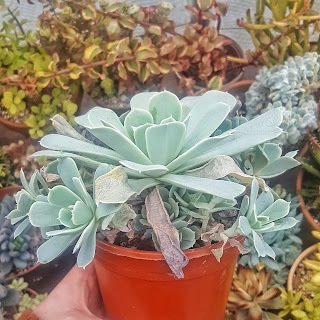 Sometimes you neglect a plant, or you find a succulent on clearance that you just have to have even though it is not looking it's best. Sometimes it can be quite daunting if you aren't too sure exactly what to do to spruce up your succulent and make it pretty again. 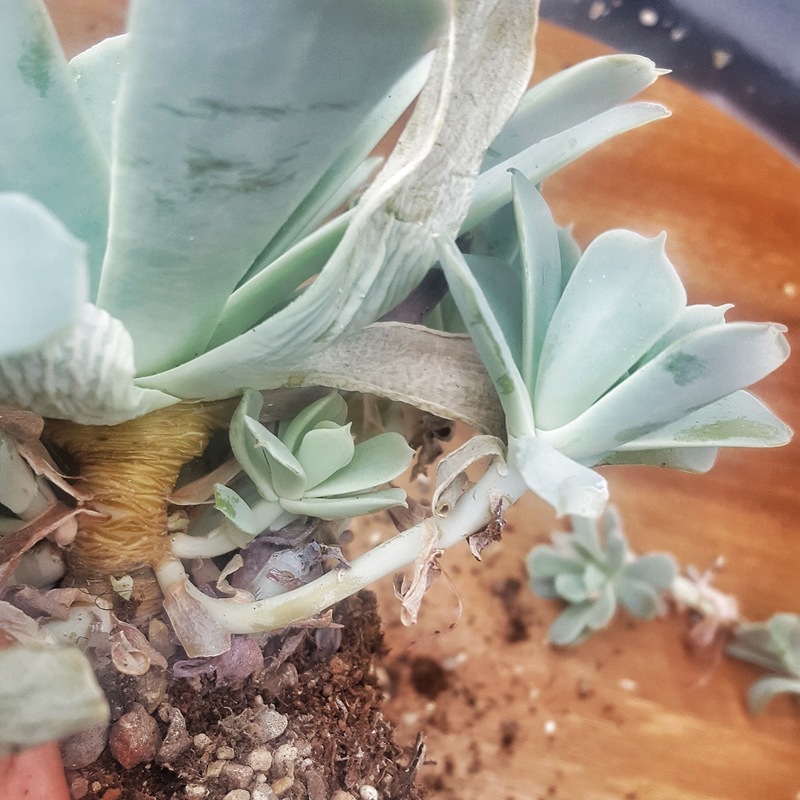 This Echeveria Runyonii has been a bit neglected by me, it has lots of dead leaves, babies spilling out everywhere and is in need of a bigger pot. She really isn't looking her best. 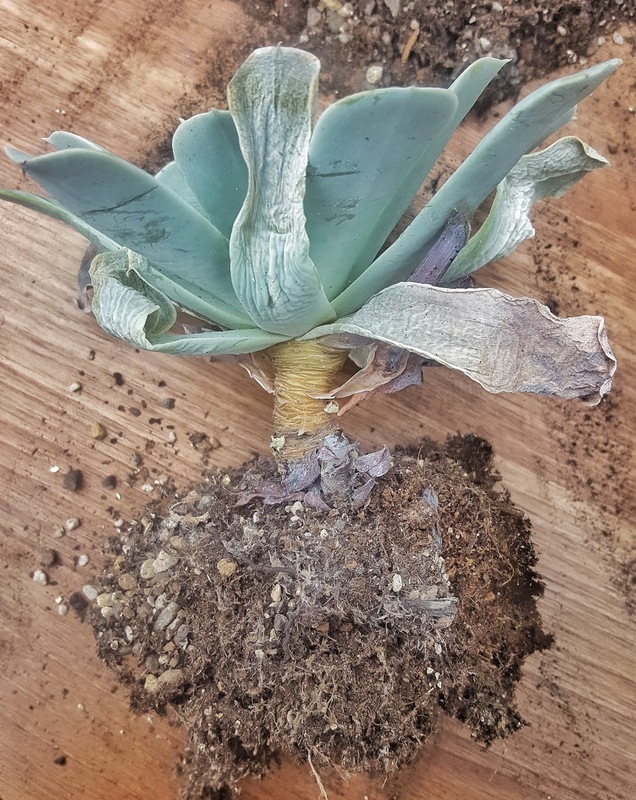 I'm going to talk you through removing all the dead leaves, separating out the babies and potting her up again so she is looking her best. First I take it out of the pot and remove some of the excess soil. Taking it out of the pot just gives you better access to the plant and allows you to see right underneath it to make sure you can pull away all the dead leaves. Taking away the dead leaves isn't just important for keeping your succulent looking nice, if you have too many dead leaves on top of the soil it can prevent your soil from drying out properly. This can eventually lead to rot, it can also create an environment ripe for mould and fungus. Removing the dead leaves will help to increase the airflow around the plant thus helping to prevent these. Once your plant is out of the pot you should have a clearer view of what is going on near the stalk of the main plant. You can see here that the offsets are connected by a small stem to the stem of the main plant. 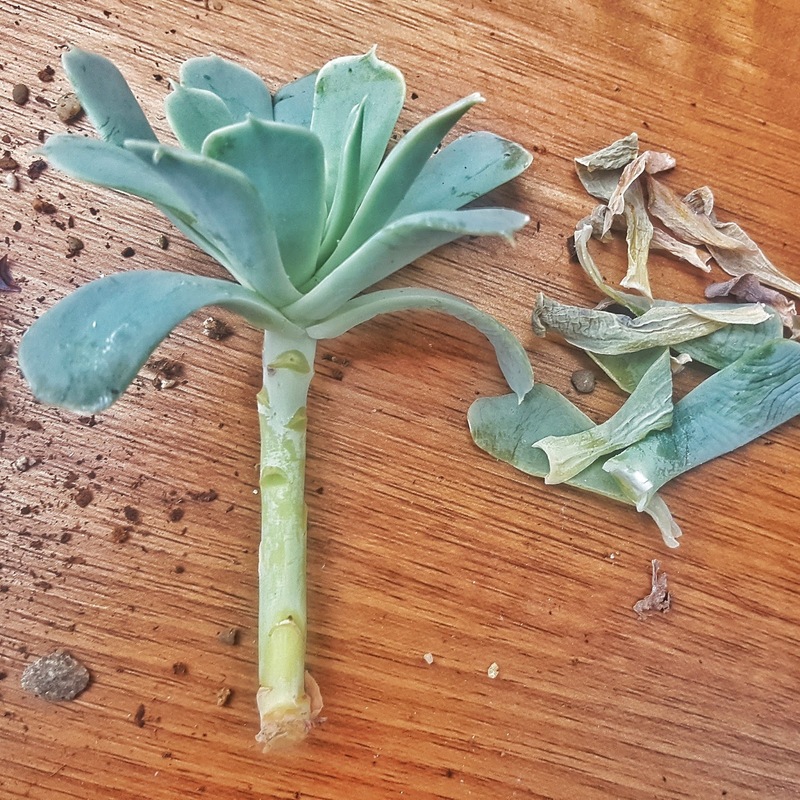 The offset stems on this particular succulent just popped off from the main plant with a small tug, some times you may need to use a sharp knife or secateurs to cut through. 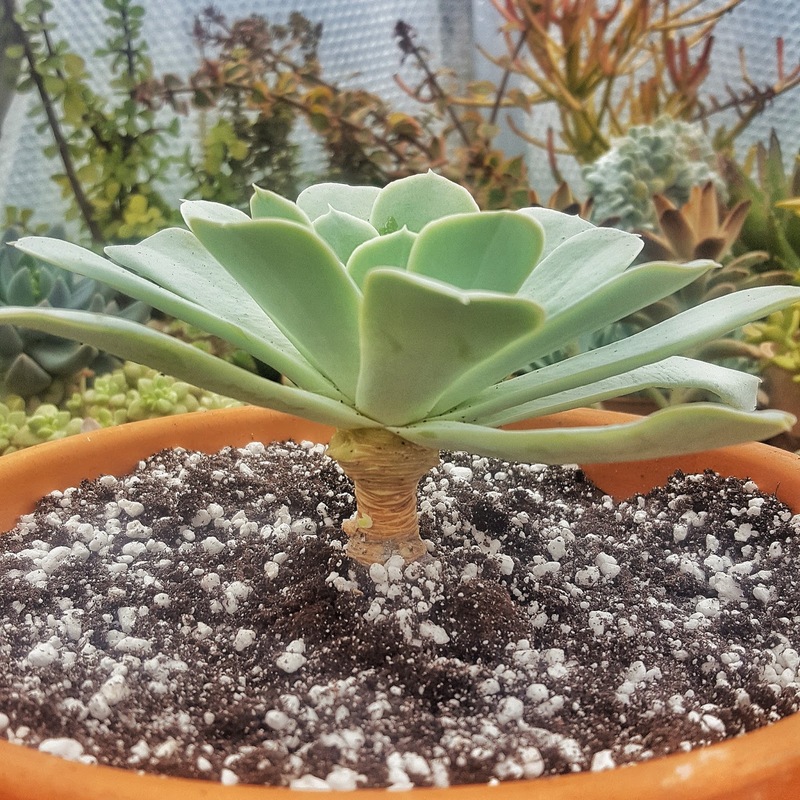 If there are only a few offsets you don't need to remove them if you prefer your plant ti grow in a nice clump or you can remove just a few and leave some. I decided to remove them because there were almost 20 of them and it was looking a little crowded. 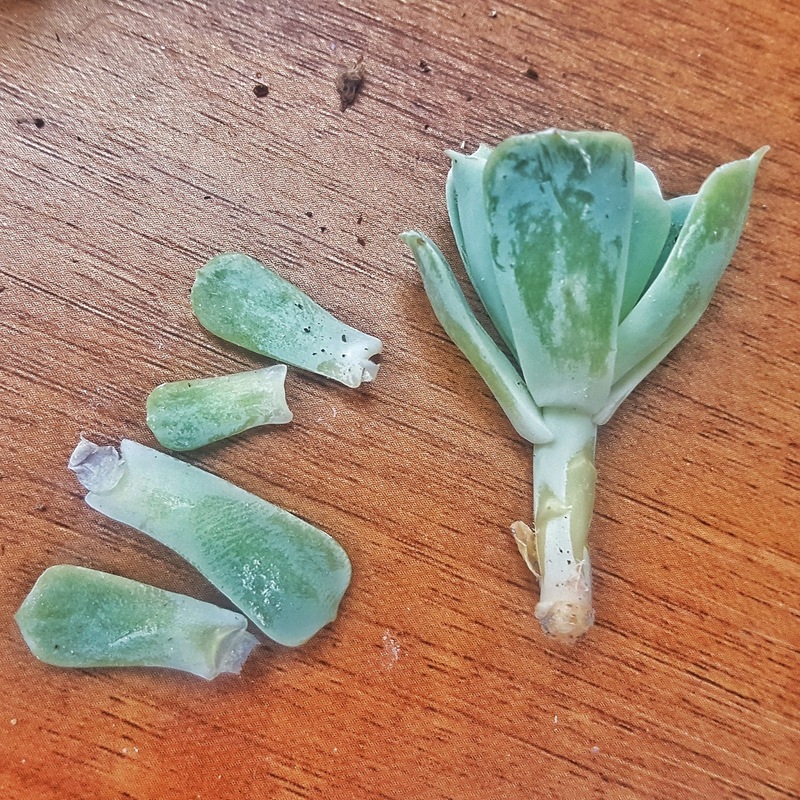 Once you have removed the offsets you can work through them one by one and remove all the dead leaves, these should pull away from the stem easily. Now is also a great time to check them all over for pests, mealybugs in particular love hiding in little crevices so checking now while you have access to the whole plant is a good idea. You will notice that the stems on some of my offsets are pretty long, you can cut these back to make them shorter and leave them to callous over before planting. You can also remove any little healthy leaves that may be further down the stem beneath the main rosette and use these for propagating. 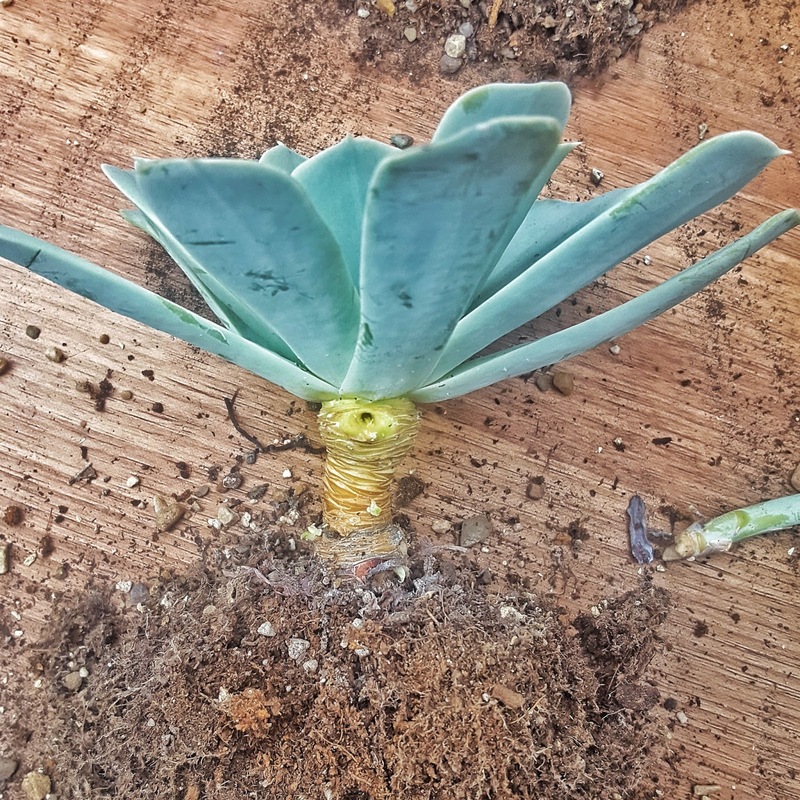 Once you have the little offsets tidied up you can move onto the main plant and begin methodically removing any dead or damaged leaves. 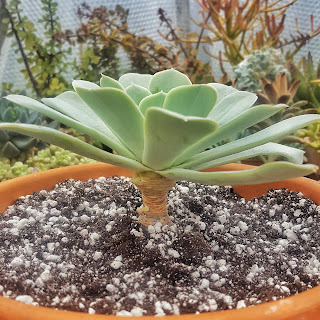 Now the stem on this echeveria is actually a bit taller than I usually like, if it was Spring or Summer I would behead it but as we are in the depths of Winter I am going to leave it like this until Spring.It does your succulent no harm to be a little bit on the tall side but I just prefer them to be a little neater. Once your main plant is cleaned up you can start planting it up again. 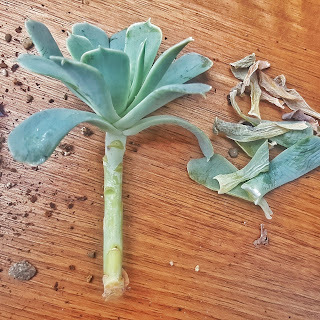 Remember to use well draining succulent soil. 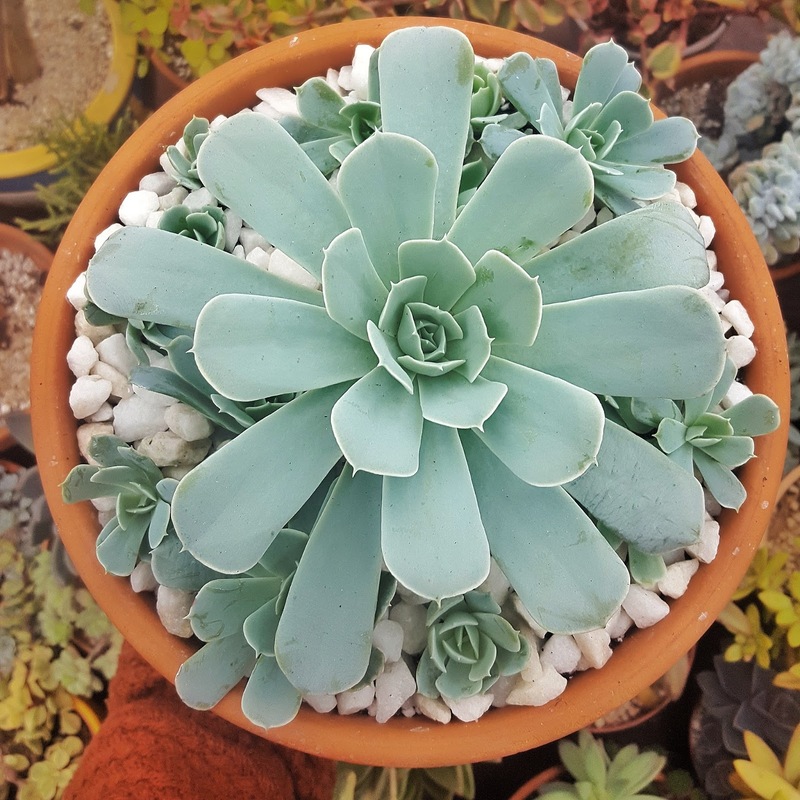 At this point if your pot is big enough you can also add some of the babies that you took off earlier or you can add a layer of topdressing to finish off the look. Because I had so many offsets I decided to plant some up by themselves and some in the pot with the main plant, I love the look of succulents grouped together. 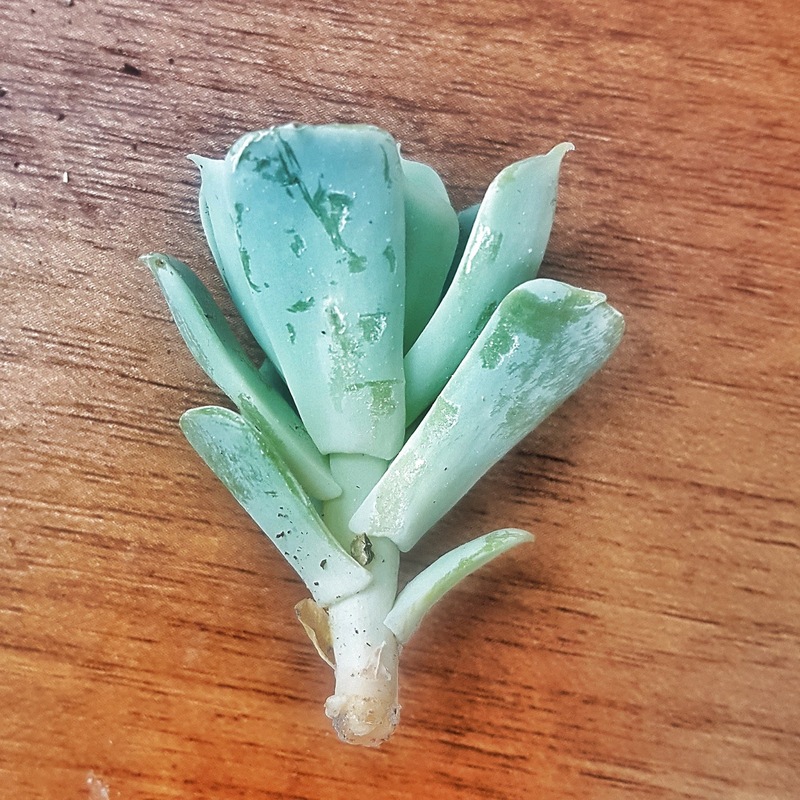 There you have it, how to refresh your succulent plants to keep them looking their best. 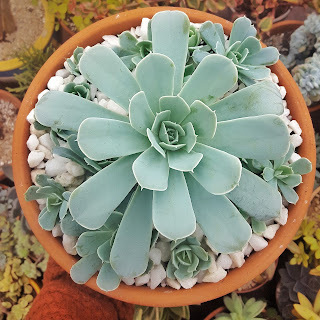 I hope you found this post helpful, if you have any questions on succulent care feel free to get in touch, I love helping out fellow succulent lovers. You can leave a comment down below or connect with me via email or social media, the links to those are in my side bar. Good tips, but that is definitely not a runyonii. 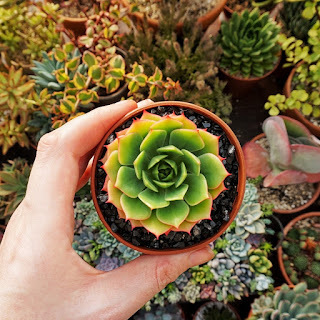 Hi there, it most definitely is a runyonii :-) When most people think of Echeveria Runyonii they think of Echeveria Runyonni 'Topsy Turvy' which is different to a Runyonni like the one is this post.